independently chosen products on this site, we earn a commission that supports our work. Disclosure: GeekWrapped helps you find the best stuff. When readers buy the independently chosen products on this site, we earn a commission that supports our work. Disclosure: When readers buy the independently chosen products on this site, we earn a commission. In a hurry? Here are the best products at a glance. A car battery charger is a good thing to keep around in your car or in your garage if you are worried about your battery dying somewhere. It can also help maintain a charge in your battery. We have put together this car battery charger buying guide to help you choose the best one for the job! First, let’s take a look at some of the things that you should know before you start shopping. Amps: Amps are a measure of how fast the charger is going to charge your battery, or how much power it’s going to draw. A higher amperage basically means that you’re generating more power. Voltage: Voltage is the current of electricity that’s put out. 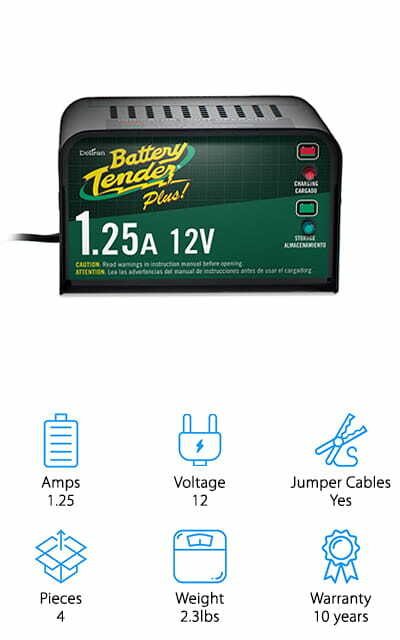 Usually, these chargers must be between 12 and 18 volts to properly charge your car battery, because it uses 12 to 18 amps of current as well. Jumper Cables: Most units come with these. It’s the method by which these chargers connect to your battery and charge it. Usually, they charge one car battery by connecting to another and discharging it. Pieces: This refers to the number of pieces that come with the charger. Some come with the cables, as well as clamps and rings to help you charge your car battery if you need it. Weight: How heavy is the charger? If it weighs too much, it’s going to be a pain to use and you aren’t going to want to lug it around with you. The lighter ones are often more expensive. Warranty: If you need this product, you also need it to work. If there’s a defect in the manufacturing, most companies will refund or replace the unit within this warranty period. It’s protection for you and your purchase! Now that you know what to look for, we can show you our car battery charger reviews! We’ve searched high and low to research and review the best products for you. We’ve got your back! Check out our top pick and budget pick first to get an idea, and then check out the other chargers on our list! We’re sure you will find the device that is perfect for you! Let’s get to the reviews! 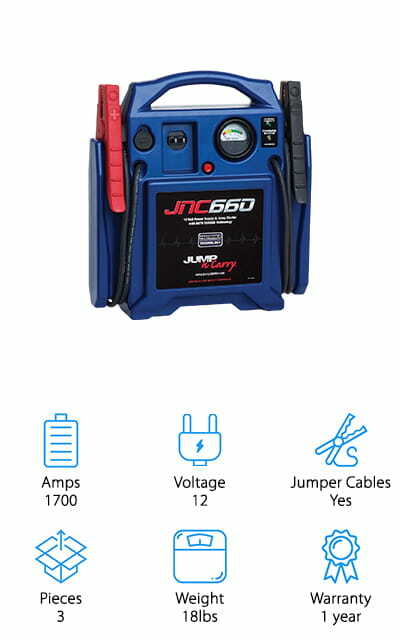 Clore’s Automotive Jump-N-Carry is the best car battery charger for dead battery problems. At peak speed, this beast generates 1,700 amps to quickly charge your battery back to working power. It comes with the jumper cables and clamps you’re going to need, as well as 46-inch heavy-duty cables that are copper-insulated for the best power input. There’s a display that contains a voltmeter that will tell you exactly how charged the unit is. That’s useful for knowing when you need to recharge it. The internal battery can be charged by a normal home wall plug. We love that this charger comes with a DC power outlet so you can power other accessories while you’re charging your battery. So if your car is completely dead, this is the perfect charger for you to use! It delivers consistent power to give you the charge you need to keep going. Even at its lowest crank speed, it’s still at 425 amps! 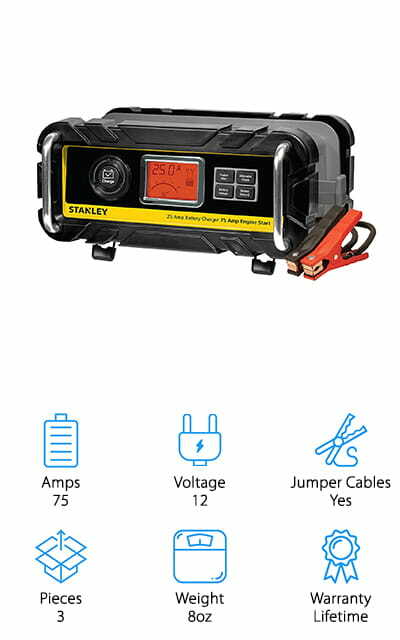 Our pick for the best cheap battery charger is the Stanley Fatmax. This charger has all of the features you need, at a budget price that can’t be beat! It puts out a pretty amazing 700 amp jump at peak cranking speed. At the lowest end, that’s still 350 amps instantly! It’s just what you need to get your car’s battery back on track! This doubles as a 120 PSI compressor with a gauge that’s backlit so you can see exactly what you’re doing and what pressure that you’re at. There are three USB outlets on this charger so you can charge all your devices at the same time! We love that! There’s also a pivoting LED light to make it easier to get things going if you happen to break down in the dark, which is always a nice precaution to have. There’s an alarm indicator if the battery detects any reverse polarity, which is pretty awesome! The NOCO Genius is just that – a genius! It is a good way to maintain and prolong the life of not just your car batter, but also your motorcycle, snowmobile, lawn mower, or ATV batteries as well. It is incredibly versatile for all sorts of batteries! It will even safely charge deep-cycling batteries that usually require heavy-duty equipment. This is all you need! We love all the technological advancements on this charger, including overcharge protection to maintain the cells in your current battery. It also has an indicator that will tell you when or if it detects any reverse polarity, which is bad news. It keeps track of how healthy your battery is, and helps to repair discharged batteries and prolong their life. It’s a great help until you can get a new car battery! It is so powerful and versatile that it’s a great idea to have one on hand just in case you need it! Black+Decker makes one of these products, and it’s one of the best car battery chargers that we could find! It charges 6 and 12-volt batteries, as well as AGM, GEL, and WET batteries – so you’ve got all your bases covered, basically! It includes battery clips (jumper cables) and all the other parts you need. There’s a DC current plug right on the front of the unit for convenience! It has smart charging technology that helps keep your vehicle charged at peak performance all the time. Who wouldn’t want that? It even has a mode that just monitors your battery’s health and charge, so it won’t overcharge and damage your battery. Basically, it does all of the research for you! Take it easy and rely on this Black+Decker charger to keep you going – it will do so without stalling out at all! We love that it’s so simple to use, and there’s really nothing you have to do! The Schumacher Speed Charge is really good at monitoring and maintaining your vehicle’s health, even in a situation where it’s stored for a while or left alone for longer periods of time. It automatically switches between charging and monitoring to make sure that your battery doesn’t get damaged due to overcharging. That’s smart! It includes the cables and rings to make sure that you have everything you need. It really is a contender for the best battery charger for sale! 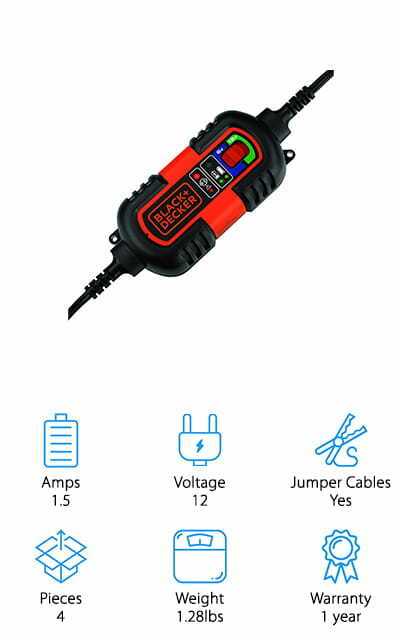 You can charge your vehicles, tractors, mowers, and even motorcycles with this charger. Keep marine batteries on hand? It’s got you covered! It maintains all of your applicable batteries at peak level, quickly and conveniently. It’s got a multi-phase charging module help increase your battery health as well! 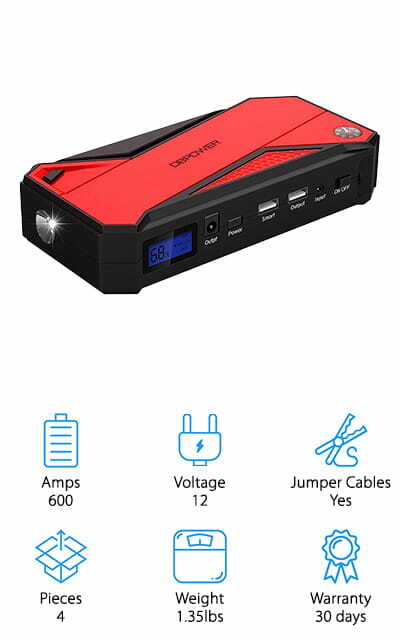 If you’re someone who absolutely must have a car battery charger, this is definitely one you should consider getting. It’s even got a quick connect and detach harness. 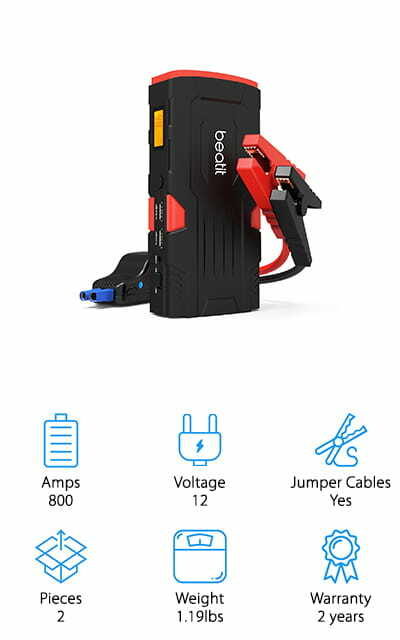 The Beatit Jump Starter stores enough juice to start your car 30 times on a full charge. That’s incredible! This battery has 18000mAh capacity, so it will charge so much, so quickly. In fact, you can use the dual USB ports on the front to charge phones or even laptops, any device that can charge via USB. It’s a little powerhouse. The clamps it comes with have protections against all sorts of problems, short-circuiting, overloading, and others. There’s a panel of LCD lights that show how much power is left on the battery. There’s even an SOS flashlight on it! It’s the perfect kit to have with you if something goes wrong. It’s better to have it and never need it than it is to not have it when it counts! It’s definitely one of the best home car battery chargers on our list! It has so many features and it even comes with a carrying case! THE DBPower Car Jump Starter is super small! It fits comfortably in your glove box. You can use it to immediately jump all types of cars or even RVs! It’s great for watercraft and farm equipment. The best part about this charger, though, is the ability to charge two USB devices as well as a laptop or other devices with the DC output. It comes with a connector set that allows you to adopt different devices to use the power source. That’s a pretty amazing feature! But it’s also intelligent. It can identify what’s charging, how fast it can safely charge it, and then gets it back to 100% that quickly. There’s an LED flashlight with three different settings, and a red emergency light as well. The display accurately tells you how the starter is working and the progress it is making. 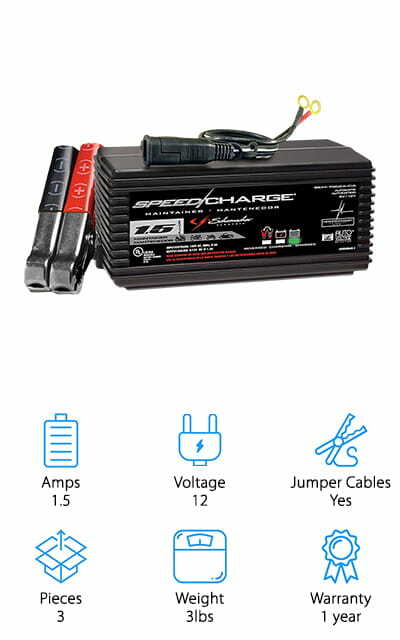 It’s no coincidence that this product made it into our best car battery charger reviews! 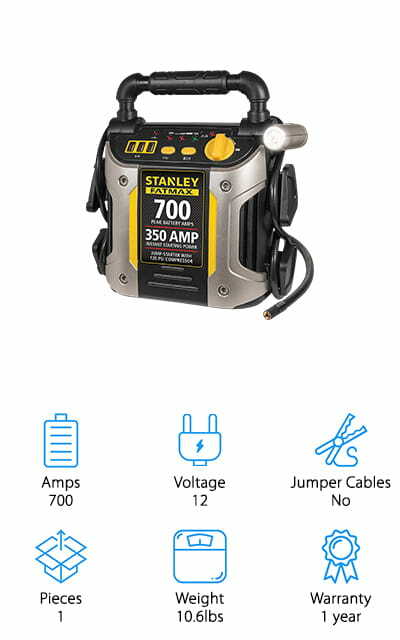 The STANLEY Bench charger is a fully automatic model that has 3-stage charging and automatically switches down to the setting that your battery needs when those needs change. It helps to recondition the battery and extend its life – that’s priceless! The LCD screen displays both the status of the device you’re charging and the internal battery, so you know how things are going. It delivers about 75 amps during a jump start, which will take only about 90 seconds to turn your engine. Additionally, it comes equipped with protection against reverse polarity. It will charge any AGM, GEL, or WET battery, as well as regular car batteries. The regular-running amperage is 25, which is still pretty fast considering it’s also reconditioning your battery. But there’s more! It comes with an alternator check so you know if you need to take it to the shop or not! It eliminates a lot of guesswork, and we think that’s the best! What is the best car battery charger? You will have to decide for yourself, but this one is definitely a good option. The Battery Tender Plus Charger independently switches between charging mode and monitoring mode, so you won’t have to worry about remembering to shut it off or checking if the battery is charged. It protects against reverse-polarity, and chargers up your battery quick enough to make you look twice. The AC power cord to charge the unit is six feet long, so you won’t be limited by space! It maintains your car’s battery at storage voltage without damaging it at all! It even comes with a quick connect harness for the harder areas to reach, so it isn’t so difficult to get it done! Includes are the alligator clamps (also known as the jumper cables) and the battery tender rings that you’re going to need to get anything done. It charges at optimum voltage! 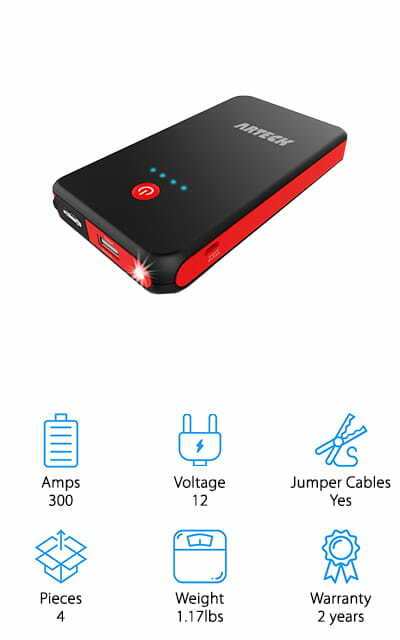 The Arteck Jump Starter has the capacity to jump your car up to 20 times on a single charge. That’s incredible! And it’s so small and lightweight, you’d never guess. 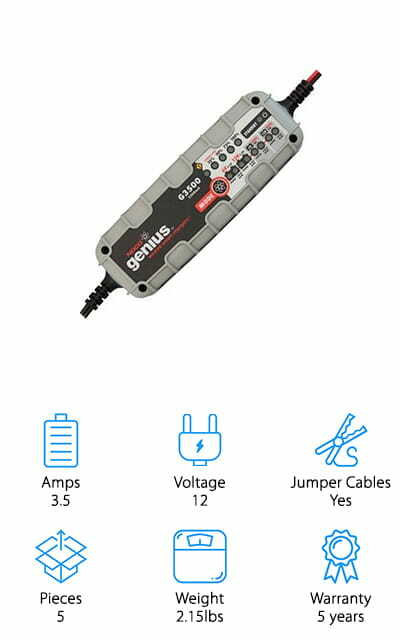 It comes with built-in heavy-duty clamps as well as cables that can easily get your car started with the 300 amp peak current speed. It’s the best car battery charger for home use because it can also charge other devices, such as phones or tablets, via USB. The unit itself recharges in about 4 hours, also via USB. It’s the coolest thing! There’s an LED flashlight on the unit as well as an SOS signal light. You can use either one of these features for about 120 hours with a full charge. There is no beating that! It is so quick and efficient; it will definitely pay for itself before you use it to jump your car 20 times. We can’t get over the features on this charger! Copyright © 2019 West Winds LLC. All Rights Reserved. GeekWrapped is not affiliated, associated, authorized by, endorsed by, or in any way connected to the brands and companies mentioned on this website. All trademarks, copyrights, and other rights are the property of their respective owners. See Terms of Service for DMCA notices.